What Was That Book I Saw On The Portland Bike Ride on June 8, 2013? Did you see that great book cover riding by on the recent Portland Bike Ride on June 8th, 2013? 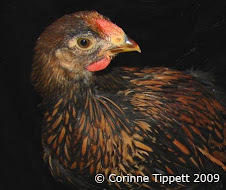 It was Just A Couple Of Chickens, by Corinne Tippett! 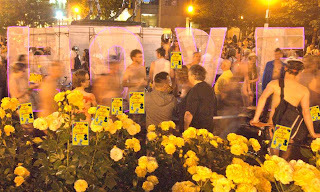 The book cover was worn by Andrew Hunt, who is a main character in the book, and who is my husband, and who was riding the "E" bike of the Love Bikes on the stunning night bike ride through the streets of downtown Portland. Andrew was wearing the book cover, and - at the request of Portland Police - a helmet and shoes... and not much else. Because it was the World Naked Bike Ride, Portland 2013! 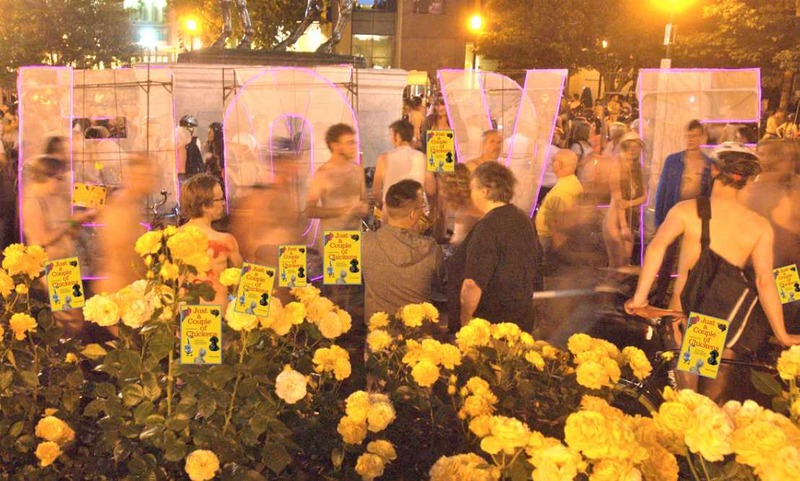 The Love Bikes are an art project originally prepared by an inspired group of bike lovers for Burning Man 2012, but also riding Portland's Last Thursdays on Alberta as often as possible. Andrew reports that the 2013 Portland ride could have been called Knock Your Socks Off amazing except that nobody was wearing socks. There's A New Aviation Biography In Town! 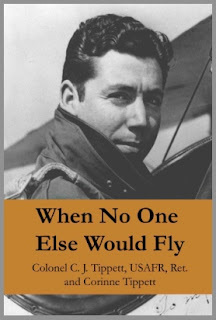 I'm delighted to announce that my long-in-the-making aviation pioneering biography of Colonel C. J. Tippett is now available on Amazon.com! "When No One Else Would Fly" is a riveting story of a man's life during the Great Depression, WWII, and throughout a time of aviation history that continues to fascinate us. The biography is in Tip's own words, wrapped in vivid historical research. It's a great read - complete with black marlin fishing stories! 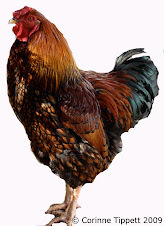 Just A Couple Of Chickens is available in E-Book format! 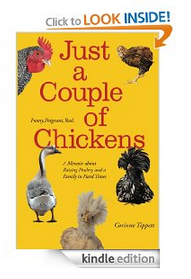 Now available in both Kindle and EPUB formats, Just A Couple Of Chickens is now an ebook! The Kindle version is available at the Kindle Store on Amazon.com, and the ePUB version is listed at Smashwords - and will soon be available on Barnes and Noble and the Apple iBookstore. While it has always been my vision to have my book in my hands, and in the hands of my cherished readers, as a real book... I plunged in and swam my way upstream in the tech flood that is e-books. I'm starting to dig e-books, but last night my battery died and I really was bent out of shape. I love real books. I love the paper and the covers and their presence. I love librarys and bookstores and stacks and stacks of books. I do love the e-reader devices. They are so swish and cool. I am amazed that I can change the font, size, margins, background color, and screen brightness. But I need to remember to plug in my darn book. It's a new world and it doesn't work well when I misplace my charger. Just A Couple Of Chickens in just a couple of formats. 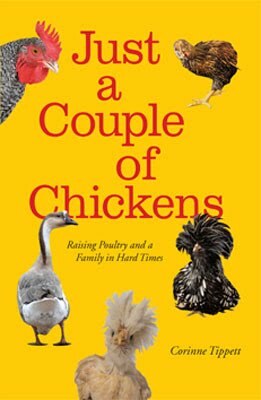 Just A Couple Of Chickens On Kindle! All of the content in this blog and in all of my websites is my own opinion, my own work, and copyrighted. Anything I say does not reflect the opinions or philosophy of my employer or associates. And the ads are supposed to be relevant and tasteful. Google has promised. This is the true story behind this blog... funny and timely and engaging, and available for $14.95 here. I’m a bug, smashed on the windshield of my own fate. I was trundling along well enough on my tricycle of life when I got Wiley Coyote’d by the second half of 2008. “It’s not an entirely bad thing that the business crashed and burned,” my husband said comfortingly (he uses optimism like a weapon). I decided to write about it, but such is the nature of it that most of what I write is largely unprintable. The modern solution to that is a blog. I can share my growing well of fermenting wisdom with truly appropriate potty-mouthed embellishments. But spectacular economic failure is not my only superpower. I can go on and on about chickens, and I have a small web based business selling things my family thought no one would ever buy. My website is www.TheFeatheredEgg.com. I’ve written a book about it all, and it's Really Great. I was a stay-home mom, but now I’m a went-back-to-work mom. The upside is that I’m not responsible if my co-workers try to choke themselves on a toy. The downside is that it’s been four months of the same four outfits in succession and I think I’m getting a rep. But I'm starting in the middle instead of the beginning.... the posts tell the story. Whassup With These Other Blogs? Every time I come across a fantastic fellow blog that I personally want to stay current with, I put it up on my blogwall above. These are particularly great.. I don't know all of these bloggers, I just love their work. Thank you for voting everyone! Although I suspect that it was you, my sistas, who filled up the poll with requests for Banal Family Stories....? 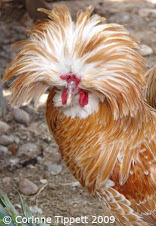 But Chicken Adventures also topped the list and so the management will comply with delight. Be a Follower! It’s a GOOD thing…. Following makes it easy easy easy to catch up on your favorite blogs. You can use or create a google or yahoo account, which is also free and easy! "Hey, That's Your Own Book!" "That's Right, It's My Own Book"
"How 'bout Just A Couple Other Books"
"Just A Couple More" is Coming Soon! "Not Really What We Had In Mind"
Thank you all for voting! We'll do some more polling soon. Whassup With All These Gadgets? I've admired some other blogs, many are featured on my "These other blogs are cool.." gadget above, that are just pure, and simple, and elegant, and jazzy clean.... but that's not what I am doing here! I am making something out of nuttin' and so that's why my gadget wall is graffiti'd with all these things. So thass Whassup with the gadgets on the right side. Google Adsense is running on this page. Google AdSense cookies and/or web beacons are used to collect data in the ad serving process. You can remove cookies by clearing your private data cache when you exit your web browser. Clearing your history is also a good way to prevent anyone else from seeing the mad tangents your web travels have taken lately... but add us to your favorites list so you can come back soon! This blog began in 2009 about events that took place in 2008 – 2009. 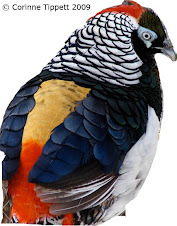 The website www.TheFeatheredEgg.com began in 2004 and is currently ongoing….